I was pretty exhausted when I checked into the Embassy Suites hotel in Maryland last night. I was greeted politely, they found my reservation quickly (always a good thing) and then it happened . . . I was told that I had been selected as their guest of the day! 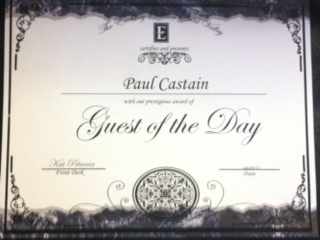 Well son of a freakin gun, not even 30 seconds before I was simply Paul Castain and now I morphed into the Embassy Suites Guest of The Day. I’m not going to lie . . . It instantly made me feel good and really appreciated! Here’s what they gave me . . .
Free internet . . . I really appreciate this one and in the spirit of a quick rant wish hotels would either stop charging for this or just build it in so I don’t see that you’re charging me. A certificate which I was thinking about waving around the lounge in the same way Wayne and Garth waved their backstage passes in Wayne’s world. A letter informing me of my “Guest of The Day” status! Here’s the bottom line folks . . . This was all done for well under 10 bucks! 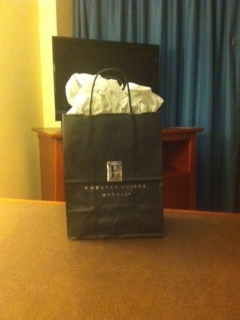 Appreciating a customer with a “random act of wow” doesn’t have to break the bank! I wonder if this is something you could utilize in your business somehow? A client of the day or week or what have you. Perhaps it could mean bagels or a pizza? A stripper? Actually I put that there to make sure you were paying attention. No matter how you choose to express it . . .
Just make sure you package it all with an attitude of APPRECIATION! Oh, and for those of you who won’t drop the 10 bucks . 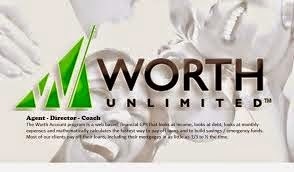 . . 10 bucks is nothing compared to the cost of going out and “courting” a new client. No? What are your thoughts about this business of “random acts of wow”? Do you have any examples you can share with us? Meanwhile, over on Rock Star University we have a webinar today “How To Bring In More Business” Find out more by clicking here!